It is Friday today but I am not too excited… The reason being tomorrow is gonna be a working day for me, sigh!!! But on a positive side I will get an extra chutti and also a chance to flaunt some more casual wear in office. So, let’s welcome the springy Saturday tomorrow with loads of fun J. Actually I have been so used to 5 working days week that it is just so tough for me to inspire myself to come on a weekday. What about you girls, do you prefer 5 day or 6 day working week? Today, I have another nice product to share with you, which was again a recent purchase. 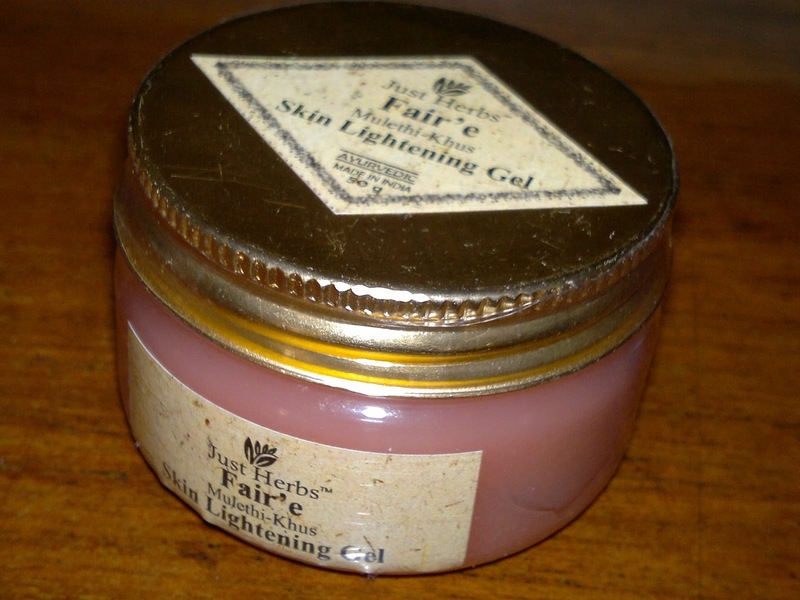 It’s from Just Herbs and is called Fair’e Mulethi-Khus Skin Lightening Gel. Now for the story behind this purchase, I was looking for a good night cream but since the weather is turning warm, I decided to opt for a gel based product. So, I was looking for gel based night creams, but couldn’t find many within my budget. Finally, I located this gel based cream but couldn’t decide if it was night cream or day cream. 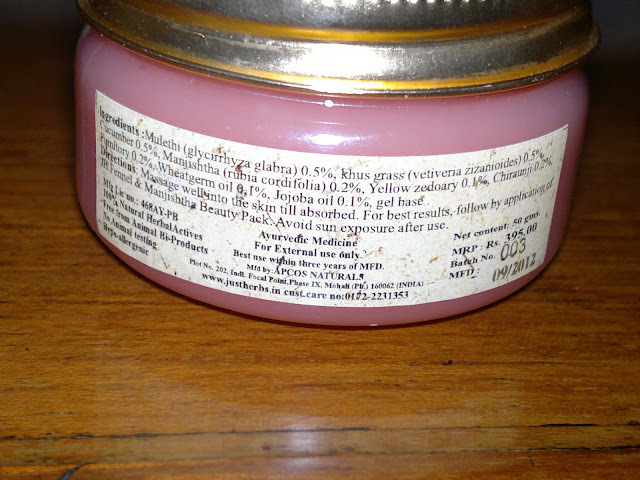 Then I read the usage instructions and found that the instructions advised non-exposure to sun after application. It clicked instantly that I should use it as a night cream, so there I was purchasing this gel on pure whim and fancy. Price: INR 395 for 50 gm of the product (I got this at a discounted price of INR 367 online. Packaging is pretty ordinary compared to the price of the product. The product is contained in a light weight, transparent plastic tub with a flimsy golden aluminum twistable cap. The lid closes in tight but I don’t think it would be sturdy for travel. 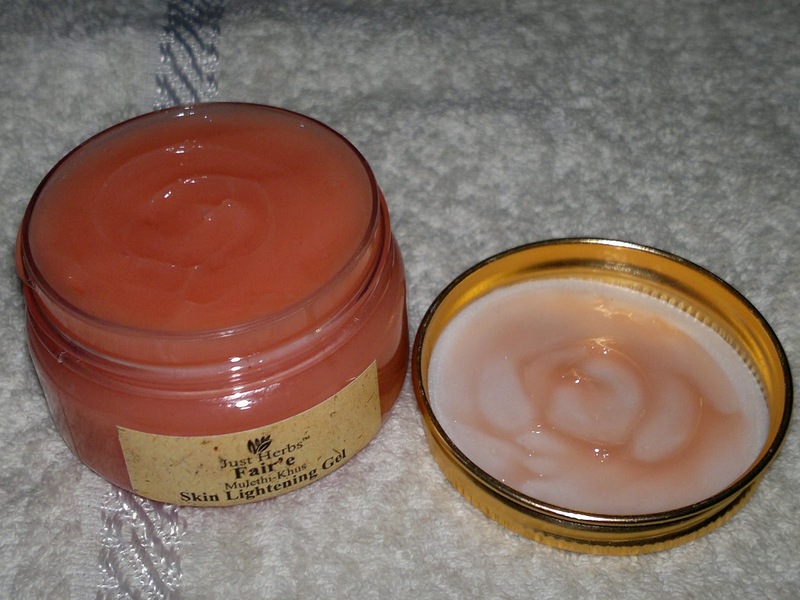 The gel is light baby pink in color with an awesome fragrance of rose each time I open the tub and apply the gel. The fragrance does linger on for some time on my skin after application. The texture is very light and easily absorbable into the skin. My skin is moisturized yet not dry or oily, the moisturization is just right. The gel upon touching is cool in texture and gives a slight cooling effect on my skin. Overall, the cream soothes my skin at the end of the day and feels very relaxing on my tired and dull skin. As far as the fairness claims I have not yet noticed a tremendous change in complexion even though that was not a concern for me. Product rating: A-, available at most online beauty websites. Would recommend to all those looking for a light weight moisturizer for night time as one has to avoid the sun after application. Personally, I may buy it again if I don’t find a better night gel/cream. Hey. I have a few dark spots on otherwise fair skin. Will this help? As it says it helps to remove blemishes. Oh and my skin ranges from normal to dry. Herbal care, according to me, is the best option and that is why, I totally adhere to the view. The skincare laboratories have the best efficiency here.